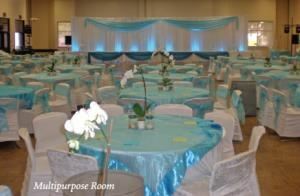 Let the Brookhurst Community Center assist you in planning your next event. The Center’s spacious multipurpose room with oak parquet flooring offers splendid accommodations for wedding receptions, dances, and trade shows. The beautiful garden patio area is ideal for intimate weddings, brunches, and luncheons. Our four carpeted meeting rooms provide business and adult education groups with a professional setting for training sessions, seminars, and classes.